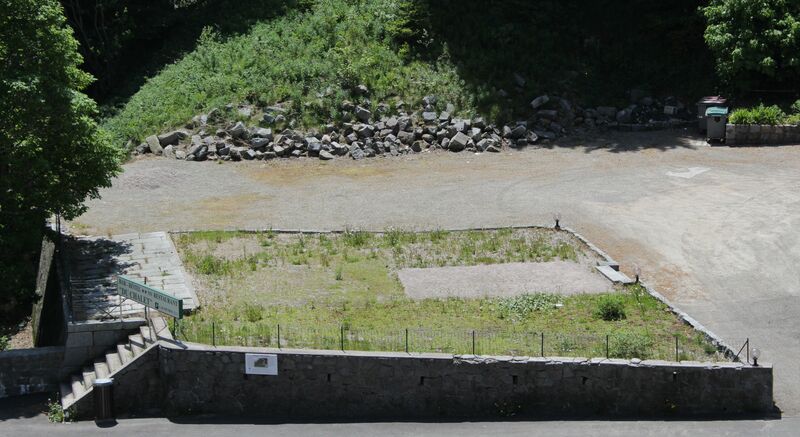 Adjoining the hotel premises is a patch of gravelly ground with a set of stone steps leading up to what looks like the foundations of a building. 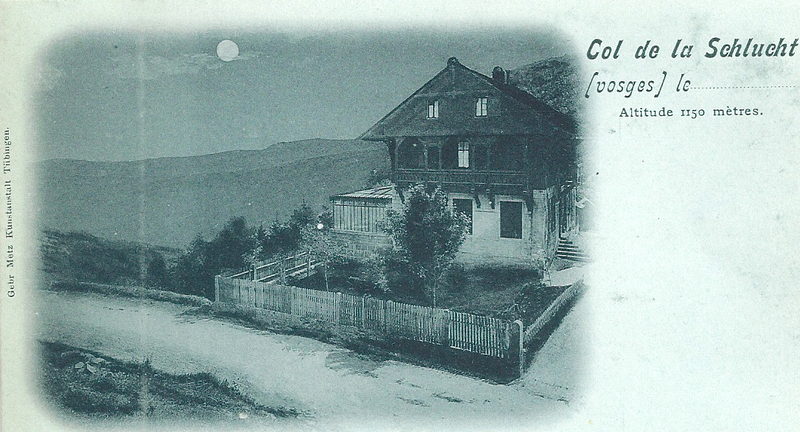 The excursionists of the Occupation era would have seen a pretty Swiss-style building called Chalet Hartmann here (seen in the second postcard above) and might possibly even have crossed paths with a distinguished visitor. 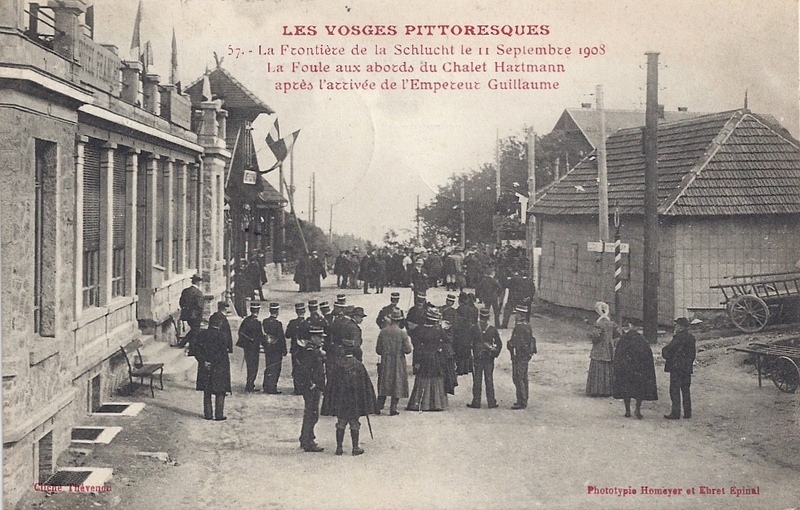 1908 – crowds linger after the arrival of Wilhelm II and his entourage. The dark building on the left is the German customs building. 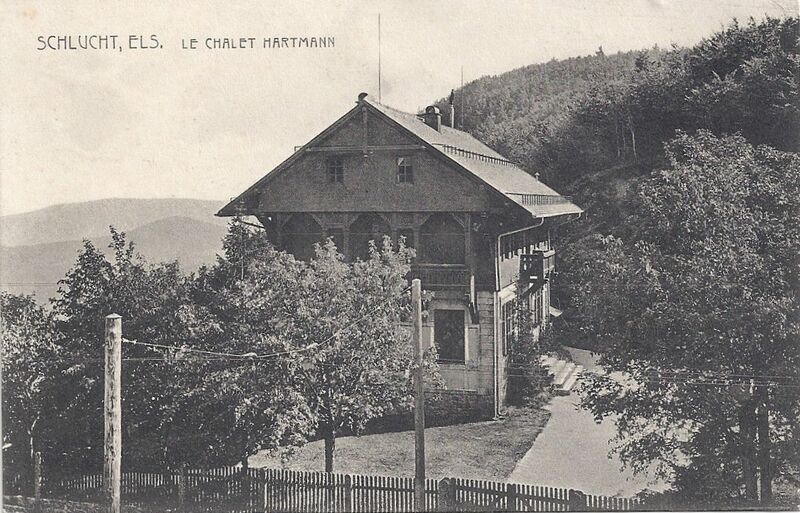 Chalet Hartmann was built in 1859/60 by a prominent industrialist, Frédéric Hartmann-Metzger, known for his fabric factories in Munster and his benevolent treatment of his staff, including establishing schools in the valley. He constructed the Chalet to mark the completion of the steep, winding road up to the Col from Munster begun fifteen years earlier. 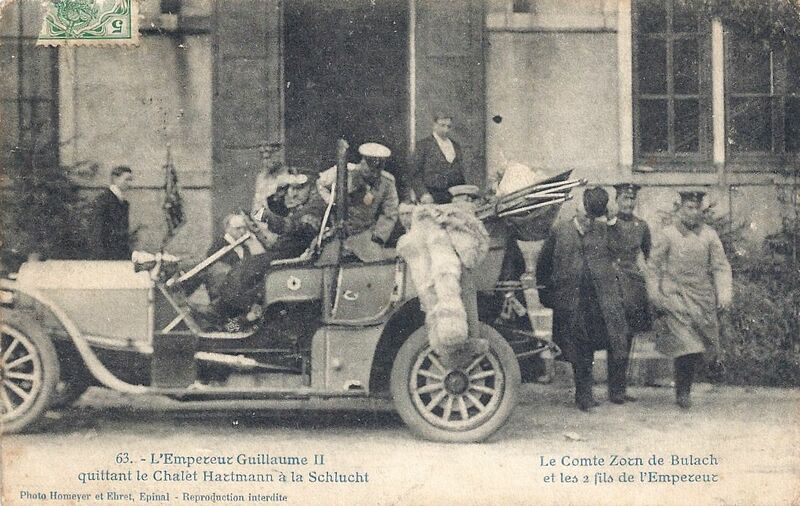 Many illustrious people visited it, including Napoléon III (twice before the war of 1870) and Wilhelm II in September 1908. 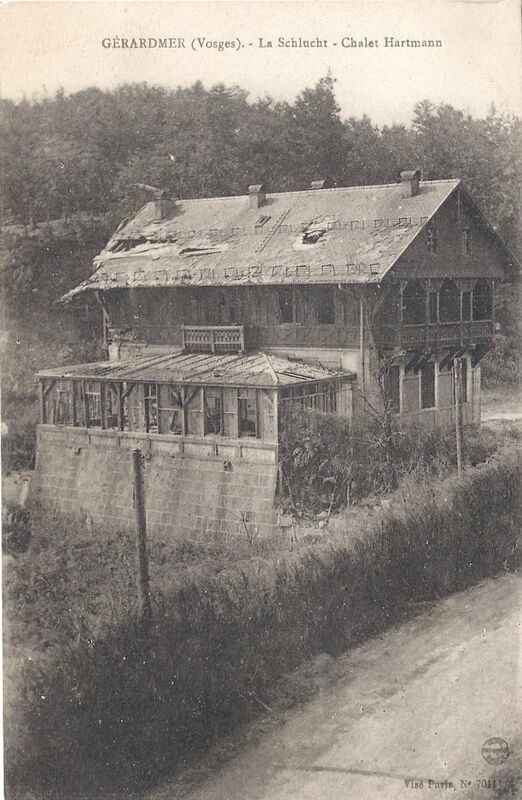 With Alsace returned to German territory, Hitler visited la Schlucht in 1940. 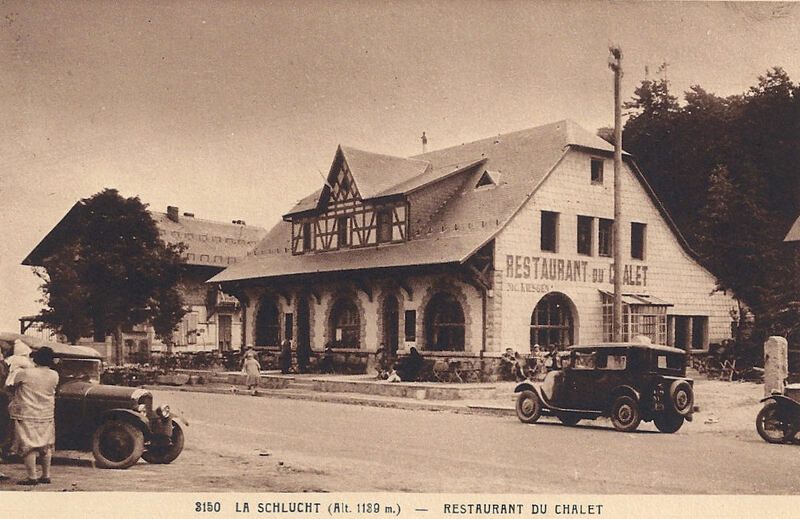 For part of its life, Chalet Hartmann was a restaurant popular with celebrities. It was badly damaged in the Great War, abandoned in the 1930s, and then damaged again in the Second World War. In 1946 it was completely demolished. 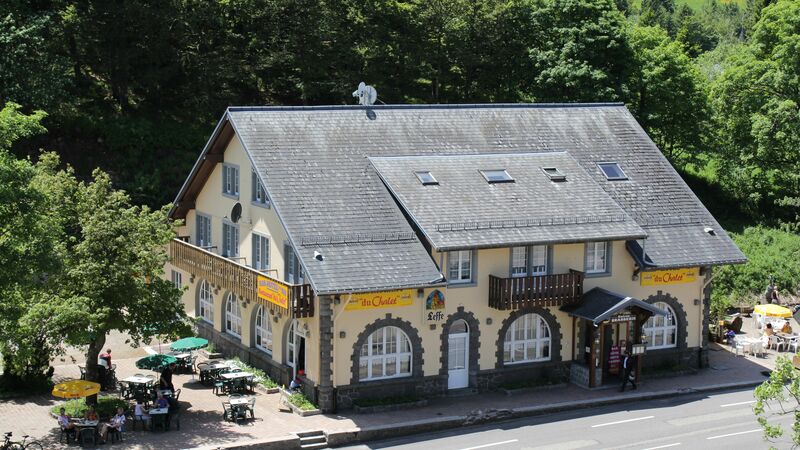 This is what the once beautiful Chalet Hartmann looks like now, photographed from the footpath which climbs behind the semi-derelict Hotel Tetras and overlooks the site of the original German customs building. All that remains is the set of steps into the house. 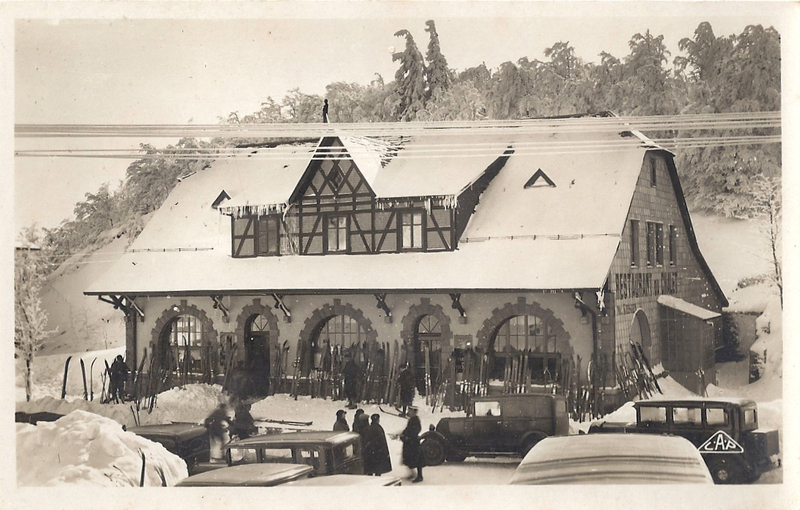 The époque of a rather elegant, leisured, somewhat romantically inclined tourist industry was over and la Schlucht began to look for modern ways of exploiting the white gold of the high mountains. Categories: A little history - the background and the early frontier, Buildings, Royalty, celebrities and personalities, Touring and tourism, Vosges | Tags: Alsace, Col de la Schlucht, First World War, frontière, frontier, Great War, Kaiser Wilhelm II, Vosges | Permalink.